Juana Molina is one of the reason I got back to this blog in the first place. It took her a little less than 5 years to come back with a new album, "Wed 21", and I wasn't willing to let it pass by me in any case. But still, here we are, seven months after its release, so I thought that while Juana is starting her European tour it is time for a focus on this very unique, close to genius, imaginative gentle-lady of a singer-songwriter and composer from Argentina. 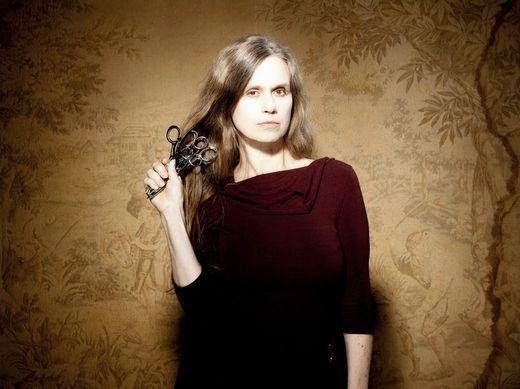 First off, Juana Molina is near exclusively singing in her native Rioplatense Spanish, and if she pays attention to her lyrics, it doesn't really matter if one doesn't understand a word of Spanish. She doesn't mind neither as she was herself from a very young age immersed into any kind of music her parents were listening to, mostly in English : classical (Schubert, Ravel), bossanova (Gilberto Gil, Antonio Jobim), jazz (Ella Fitzgerald, Sonny Rollins), rock (The Beatles, Deep Purple, King Crimson), whatever they saw enjoyable, therefore she has a similar approach to near anyone non-English speakers towards songs sung in English, the lyrics are somehow secondary and it doesn't hinder the listening pleasure. As Juana Molina emphasized herself during a recent interview, not understanding or not paying too much attention to lyrics allows the listener to interpret the words the way he or she feels. Oddly enough, Juana's dad was some prominent tango singer, Horacio Molina, and even though he taught her guitar from the age of six, there is no tango influences in Juana Molina's music. On the other side, she spent many summers in a house her family shared with two major artists of Brazilian music, poet and composer Vinicius de Moraes and bossanova star Chico Buarque. These guys, added to what mom and dad were musically enjoying, had a far stronger impact on Juana Molina's art than anything Argentinian, except for native instruments, her dad included. Juana Molina's biography would deserve a whole book. For example her command of French is pretty good. I had the advantage to witness it for myself, at one of her gigs here in Brussels where she was introducing and/or commenting on her songs or technical failures with much humor and in close to perfect French. Well, her family spent years in exile in Paris following a military coup in Argentina to start with. Should I mention her extremely successful and popular TV comedic acting career in Argentina in the late 80s/early 90s? I just did. From the start, her first call has always been music; a difficult pregnancy made her get back to her initial vocation. But if you're curious, just find out more for yourself. This blog is focused on music and music is what we'll talk about if you don't mind.